Many people are talking about there being a paradigm shift but from what to what? And what to do about it? Mark Heley makes an argument for the nature of the changes happening in the world today being systemic, fundamental and irreversible. Drawing on insights from cutting edge science to ancient cultures and prophecies, “2012: Paradigm Shift” aims to show what the organizing principles of the emerging culture are, and how to align with them to move forward. 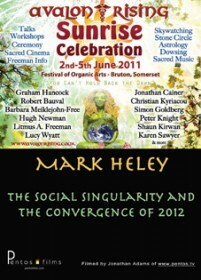 Mark Heley has spoken at many events around the world including Burning Man, Earthdance and the Boom Festival. He is the author of “The Everything Guide to 2012” and has been researching the bleeding edge of science and culture for many years.